Some of you may remember a story I posted a while back about getting chased off of a public sidewalk by security guards at a decommissioned power plant. A lot of people asked why I didn't stand up for my rights on the spot. Instead of arguing on the street with security guards and potentially the police, I thought it best to move along and resolve the matter with the appropriate authorities. My intent was to call Austin Energy and possibly city offices in the morning, but before I could look up the numbers I was contacted by someone from Austin Energy who had stumbled across my blog entry about the event just a few hours before! All things ended up for the good and I was invited to come out to the plant and photograph the plant inside and out. So, I rounded up a group of some of my photog friends and we got a special opportunity to shoot this great place before it gets demolished later this year. 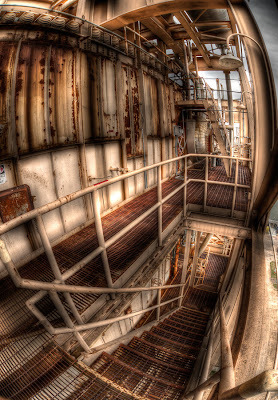 Because I knew ahead of time that lighting conditions would be poor without any power to the old plant, I invited a bunch of guys like me who tote around tripods for HDR shooting. I want to thank Ed at Austin Energy for making this happen. A huge thanks also to Carlos and Bobby out at the plant for graciously guiding us through the building and waiting patiently for us to get our shots. I thought it would be cool to share a shot by each photographer. It's great to see the different perspectives we captured. 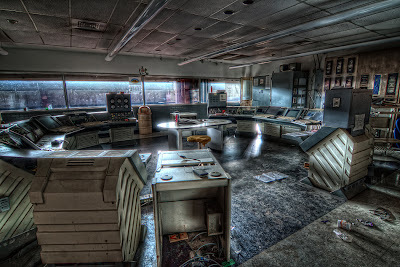 My favorite personal shot was this control room. I had to climb a creaky staircase to get to this dark room. Only a little light filtered into the windows from across the turbine hall. It was so surreal seeing the room empty and dusty with things in place as if everyone just got up suddenly and left. It was a creepy feeling and I just took this one shot before moving on. We had a long time to play around in the turbine room of the plant. I did a lot of closeup shots and would have liked to have gotten a grand view of the room, but I didn't find a composition I liked. My good friend Andy came through with this shot. His overhead view from a balcony outside of a control room is just the ticket. This staircase was shot by Dave Wilson. Being as afraid of heights as I am, I opted not to wander out on the many outside stair cases. 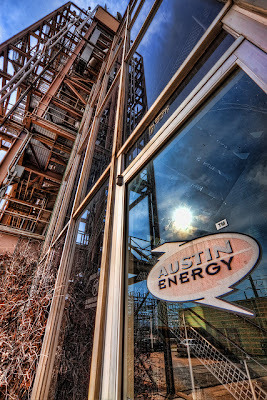 This HDR shot brings out some great tones from the rusty structure. There is a warped perspective created by the lens that draws me in and makes me think of how I feel when confronted by stairs at a great height! Alex Suarez was a little late in joining us but he got some nice closeup details. I like his shot of this confined space entry point. His B&W treatment is very suiting for this shot. Here's a "Why didn't I think of that?" image. 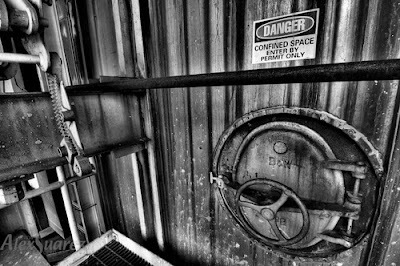 Michael Tuuk grabbed this cool shot of one of the entry doors to the plant. I really like his composition with the reflections in the door and the towering structure of the plant up the side. 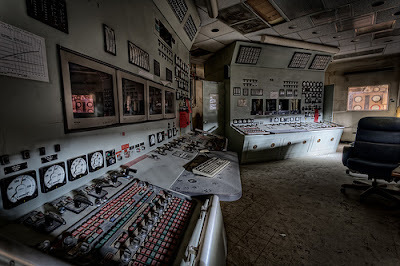 My friend Van got this great shot of another control room. I love this wide angle capture of the entire room. It's amazing work in very difficult lighting and his HDR treatment makes this image really pop. Last, but certainly not least, is an artistic shot by my friend Tony Tobin. Tony has great skill at capturing artistic shots, especially in low light scenarios. 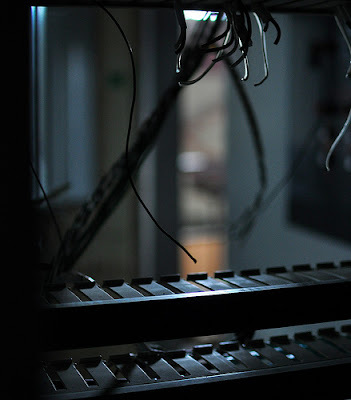 I like this shot of his through a cable rack. The shapes, lighting, and bokeh are very appealing. 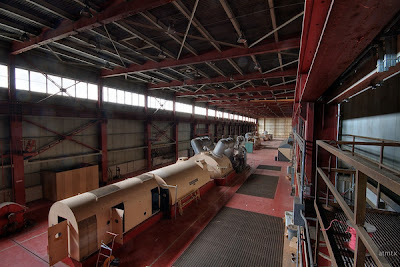 There you have it, 7 perspectives of the Holly Street Power Plant from 7 photographers. We're only a few days out from the shoot, so be sure and check our sites for more to come as we process the images we captured. We had a blast!